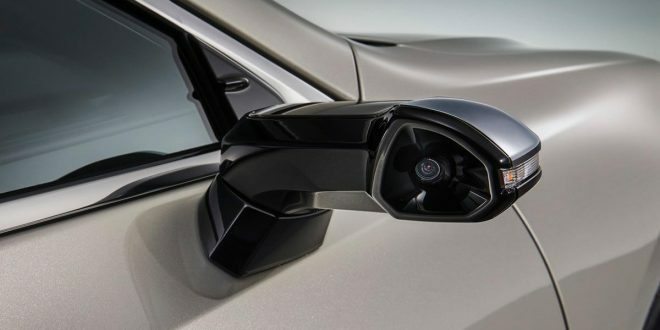 Lexus has announced it will become the first auto brand to replace side mirrors with digital cameras. The tech transition will commence with the all-new ES sedan in Japan, which goes on sale next month. Designers and safety advocates have long suggested a move away from mirrors to more accurate camera systems. In the U.S. regulations surrounding side mirrors are more complex than Japan, which adopted rules allowing for cameras to replace side mirrors back in 2016. For that reason, this feature will only be offered in Japan. On ES’ equipped with the system, the large traditional side mirrors are swapped out for sleeker side wings that house a camera. The camera image is then projected onto five-inch screens mounted at the base of each A-pillar. Lexus says the system has many benefits, including greater visibility to both the sides and rear of the car. The system is also aiding in reducing wind noise; a notorious downfall to bulky mirrors. Less bulk is also allowing for improved visibility out of the side windows. For now the ES is the only Lexus product offering what it calls its “digital outer mirrors.” The company says it will use the ES as a test before rolling it out to more models within its range.